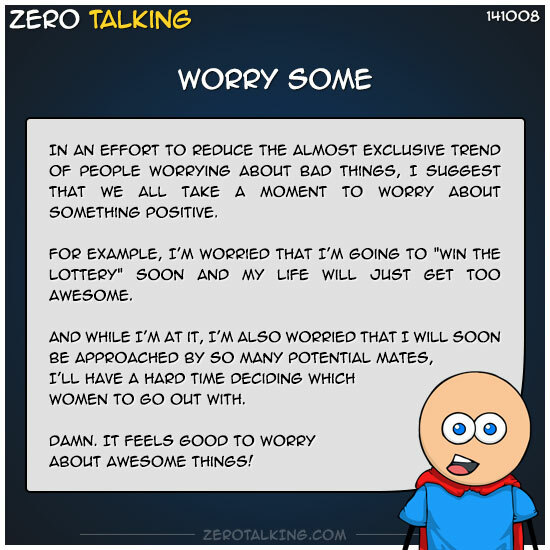 In an effort to reduce the almost exclusive trend of people worrying about bad things, I suggest that we all take a moment to worry about something positive. For example, I’m worried that I’m going to “win the lottery” soon and my life will just get too awesome. And while I’m at it, I’m also worried that I will soon be approached by so many potential mates, I’ll have a hard time deciding which women to go out with. Damn. It feels good to worry about awesome things.